There is a new energy rush among many Greater Caspian states, one that continues to focus on breaking free of the heavy Russian influence while also diversifying their supply chains. However, in the continual game of energy politics, many geopolitical and geostrategic foes have been born. One such nation, Turkmenistan, is spearheading an energy initiative that will both diversify and expand its customer base while at the same time release itself from Russian authority. In addition to being a landlocked country and a former Soviet Republic, the nation is also the richest Caspian state in natural gas and untapped energy resources. Yet the nation has also struggled throughout the past in diversifying its export transportations. This issue stems back into the 1980s and 90s when Russia attempted to exert its influence throughout Central Asia by occupying Afghanistan. During this time Russian gas giant Gazprom refused to sign an energy deal with Unocal – a previous petroleum explorer and marketer based in California – over a Trans-Afghanistan pipeline, due to U.S. support for the mujahideen, a move it believed was aimed at undermining Russian influence in the region. Moreover, Gazprom’s chief executive at the time, Rem Vyakhirev, declared that Russia would not allow Turkmenistan or Kazakhstan to export its oil and gas through non-Russian pipelines. This was aimed as a move that would eradicate any form of Russian influence or energy developments throughout Central Asia in the near or far future. While projects like the aforementioned Trans-Afghan pipeline failed to develop and efforts to build the Trans-Caspian pipeline are continually stalled due to political contestations, on December 13, 2015, a deal outlining the details to build the Turkmenistan, Afghanistan, Pakistan, and India (TAPI) pipeline was signed. This ratification hopes to allow the destination countries to break free of those political and economic chains that have restricted Turkmen gas from diversifying its transport routes and becoming independent of Russian influence. Nevertheless, this may come with a price of its own. The timeline to begin operations is set for the year 2019 and will hold a cost of over $10 billion USD, from which Turkmenistan is the leading sponsor. The TAPI pipeline will have the ability to transport an estimated 33 billion cubic meters (bcm) per year. But with all the hype and allure of generating energy independence, diversifying exports, and expanding each destination country’s energy infrastructure, there has also been a lack of foreign investments as well as various geopolitical ramifications tied to these attempts at building another pipeline. The TAPI pipeline is alive today due to Turkmengaz’s 85 percent stake in the project—leaving the remaining 15 percent stakes split equally among the destination countries. Turkmengaz is the national gas company of Turkmenistan and the largest gas company in Central Asia. Its lead investment depicts Turkmenistan’s prioritization to generate energy diversification and independence, which the nation believes are necessary to keep pace with its domestic productions that are slowly surpassing its current export capacities. Before 2011, Russia was Turkmenistan’s main market for imports of natural gas. However since 2011, China has become the recipient of the bulk of Turkmen natural gas exports. This was made possible by the willingness of China to create the necessary environment. Since these expansions, two-thirds (45 bcm) of natural gas has been transported annually to China, with the rest being split between Iran (9 bcm), Russia (9 bcm), and Kazakhstan (0.5 bcm). This new China pivot presents two geopolitical problems. First, this shift away from Russia may aggravate regional tensions as Moscow may observe this move as one that once again attempts to undermine its influence across the Greater Caspian and Central Asian regions. Second, even if the TAPI pipeline allows the sponsor nations to escape the grip of one of the largest Caspian powers—Russia—they may find themselves shackled to the dominance of Beijing, a move that would only replace one great power with another. China is already closing its economic grip on the project, seeking to assist in financing Pakistan’s 5 percent stake through its $46 billion USD investment project known as the China-Pakistan Economic Corridor. Furthermore, Afghanistan, which already has limited financial resources and a security situation that presents multiple dilemmas, must raise 3 percent of its own financing before the Asian Development Bank will provide the rest. Undoubtedly, the single most important consideration during the development and construction phase will be to stabilize the security situation in Afghanistan and Pakistan. In addition, territorial conflicts and boundary disputes stemming from Pakistan and India over Kashmir must be quelled in order to attract more outside investors and improve the overall security situation. 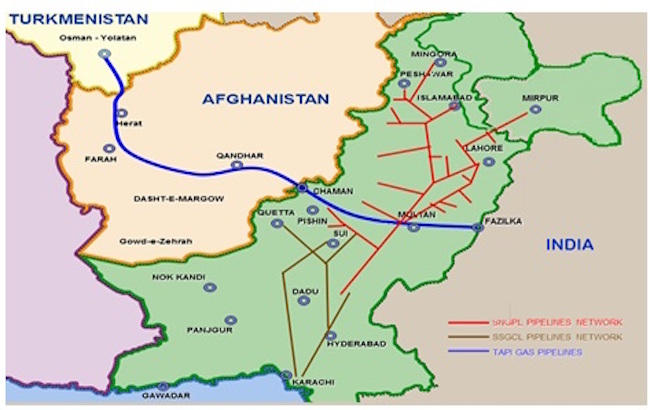 Russia and Iran may observe the TAPI pipeline as a hindrance to their own economies and may surreptitiously exacerbate the security issues stemming heavily from Afghanistan and Pakistan. This may lead the two nations to indirectly economically and politically suppress the effort to build what some are calling “The New Silk Road”, perhaps rendering the TAPI pipeline nothing but a pipe dream. Despite the various historical tensions, conflicts, and uncertain security equation throughout the destination countries, the success of the TAPI pipeline may be more possible than it seems. This is because Turkmenistan’s president Gurbanguly Berdimukhammedov, has actively pushed each country’s leader to move the project forward, offering them a direct, unobstructed investment in another pipeline project originating at the world’s second-largest natural gas field—the Galkynysh natural gas field in southern Turkmenistan. It would be against any of the destination countries’ best economic interests to muddy the waters of an opportunity this large. Moreover, the political will of each nation and the economic prospects for the region could be balanced against the long and still powerful grip of Russian energy controls. In short, the TAPI pipeline is not just a quick-fix solution to energy independence. Rather, it is a calculated, coherent, and long-term energy focused strategic vision for the Greater Caspian state of Turkmenistan and the Central Asian states of Afghanistan, Pakistan, and India. Andy Deahn is a 2015 graduate with a Bachelor of Science degree from Bellevue University’s International Security and Intelligence Studies program. He is currently employed as a Field Service Engineer at the Sierra Nevada Corporation (SNC) providing aerial surveillance and intelligence analysis for the Department of Defense throughout various worldwide locations. He had previously worked as Special Tactics-Tactical Air Control Party member in the U.S. Air Force supporting Army Special Forces ground teams as a Joint Terminal Attack Controller.